To continue informing the public about one of the most comprehensive transportation plans ever proposed for north Los Angeles County and San Bernardino County, the Los Angeles County Metropolitan Transportation Authority (Metro) and the California Department of Transportation (Caltrans) will host a series of public hearings to receive input on a Draft Environmental Impact Report/Environmental Impact Statement (EIR/EIS) on the High Desert Corridor (HDC) released September 30, 2014. 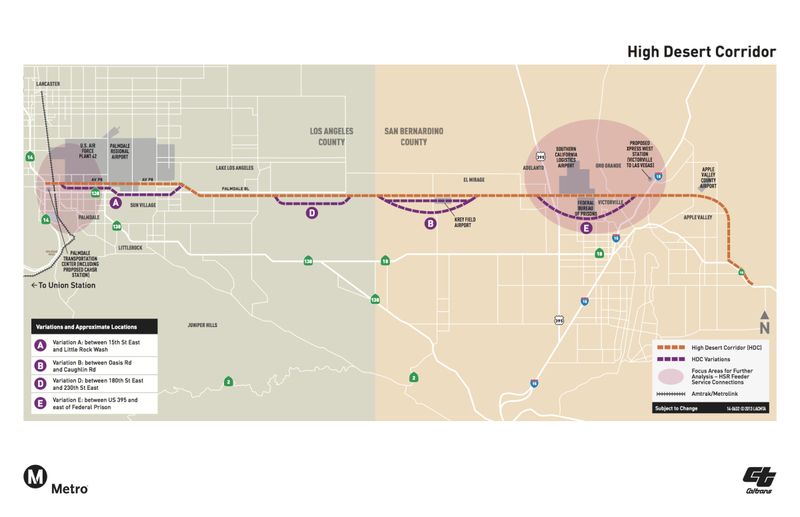 The public comment period, open until December 2, 2014, seeks input on the HDC, a 63 mile corridor connecting SR-14 in Los Angeles County with US-395, I-15 and the SR 18/Bear Valley Road in San Bernardino County. HDC aims to improve travel safety and reliability while connecting residential, commercial and industrial areas in the Antelope Valley and Victor Valley, with major elements under study including a new highway/ expressway, tollway, high speed rail feeder service, potential green energy production and/or transmission facilities and a bikeway. The Draft EIR/EIS considers four build alternatives and the legally required “no build” alternative. Wednesday, November 5, 2014, 7 p.m. – 9:30 p.m.
Thursday, November 13, 2014, 6 p.m. – 8:30 p.m.
*These meetings will be broadcasted live on the Internet. To participate, please go to ustream.tv/channel/metro-high-desert-corridor. Webcast begins 30 minutes after each start time. The public is encouraged to review the Draft EIR/EIS and plan on attending the upcoming public hearings. The public is asked to assess whether or not the potential impacts have been addressed and provide any information that should be included in the final document. Following the comment period, Caltrans and Metro will evaluate the comments received, revise the document as needed and select a preferred alternative. Public Hearings – Verbal and written comments may be submitted during any of the four public hearings noted above. I would like to see a lightrail transportation system built across the corridor along with the freeway system. Something like the 210 frwy in Pasadena, Ca. You think! A Metrolink line would work very well, and Victor Valley residents would finally get their commuter rail, too.